I have a finish! I took the last stitch in Leo’s Mane last week. Yesterday I released all the outer edges from the basting and pressed them open. Then I stay stitched the edges and removed all the papers around the outside edges. 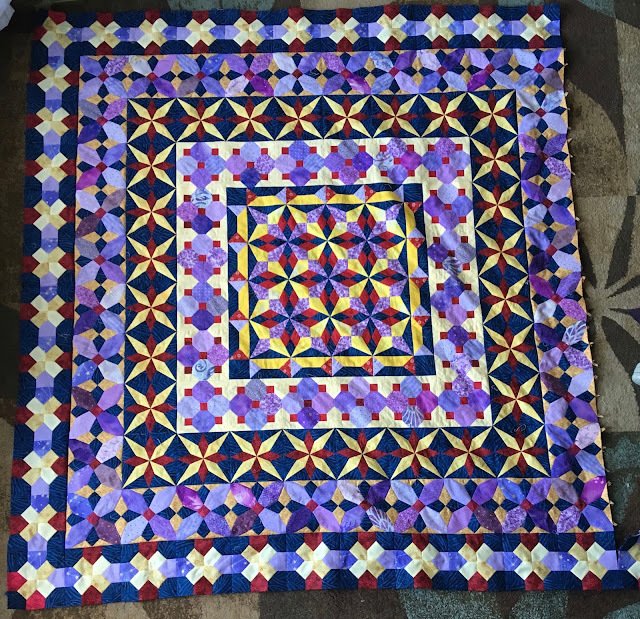 It is ready for quilting. Woohoo and yippee!! So what’s next? I’ve been asking myself that for a while. 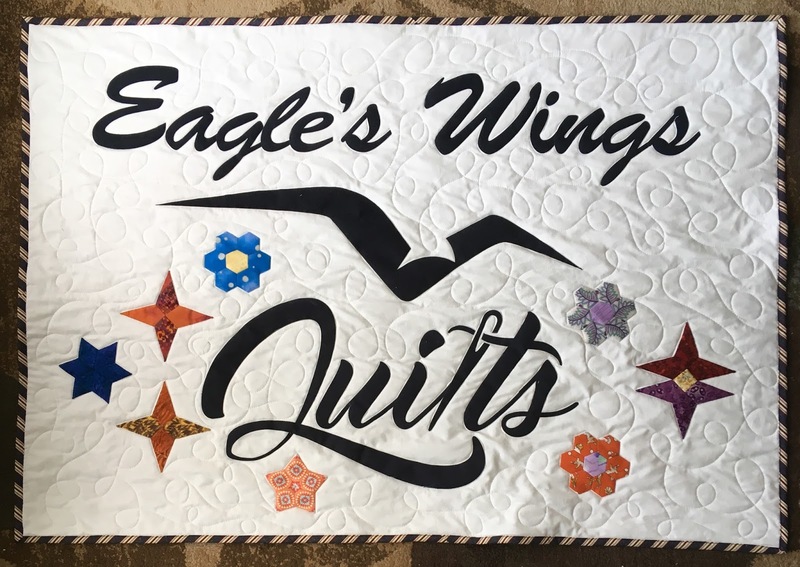 When Charlene and I were at the quilt show in Shedden working in the vending booth, there were a number of people who made enquiries about possible classes and teaching using basic English Paper Piecing shapes like hexagons and 60 degree diamonds. The small project that I did based on Willyne Hammerstein’s Creme Brullee attracted a lot of interest. But I don’t own that design so I can’t in honesty use the design for teaching purposes. However I do have a design that was done in Electric quilt based on 5 different 60 degree shapes which I started putting together a couple of days ago. This is what I’ve got so far. I’m winging it right now for putting it together. As I am sewing it together I am seeing ways to make it easier and to break it down into units that will make it better for a teaching sample. Once I’ve worked through putting this one together I’ll do another and take pictures as I go. It might end up a written pattern as well. So, I’m going to link up to Kathy’s Slow Sunday Stitching and get back to working on this sample. We had an unexpected and very pleasant trip to see our grandson Avery yesterday. It involved 3 1/2 hours in the car to get there and 3 hours in the car to get back home again. But it was well worth it. And what does a person who is sitting in a car, obviously not the one doing the driving, do but occupy the time with stitching. This resulted in three out of four of the last of Leo’s Mane’s border being stitched to the main body of the quilt. One more to go and it is finished. WOOHOO!! The light wan’t very good for taking the picture, but you get the idea. But the bigger WOOHOO yesterday was the opportunity to see our grandson Avery. While we were up visiting Avery, we decided to have a picnic and have some fun flying kites. We didn’t quite take into account that the precipitation that fell here last week as rain and freezing rain fell as snow where he lives. So we had a picnic in the snow. We got some interesting looks from passers by who must have thought we were slightly out of our minds. We also flew kites through the snow. The kite flying wasn’t too terribly successful as there wasn’t a lot of wind. But that was probably just as well since more wind would have made the picnic and being outside too cold. We had fun anyway. And then we went and found a leftover mini mountain of snow ploughed up from a parking lot. The boys had a lot of fun with that. It was a fabulous day!! 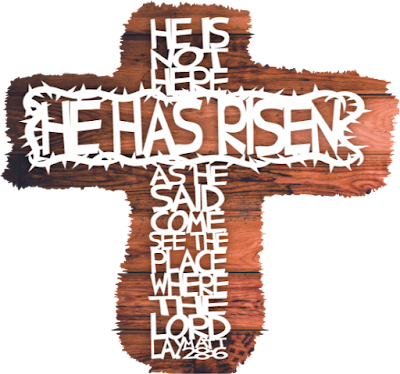 Today is going to be much more peaceful, with some reading, going to Church and some stitching. 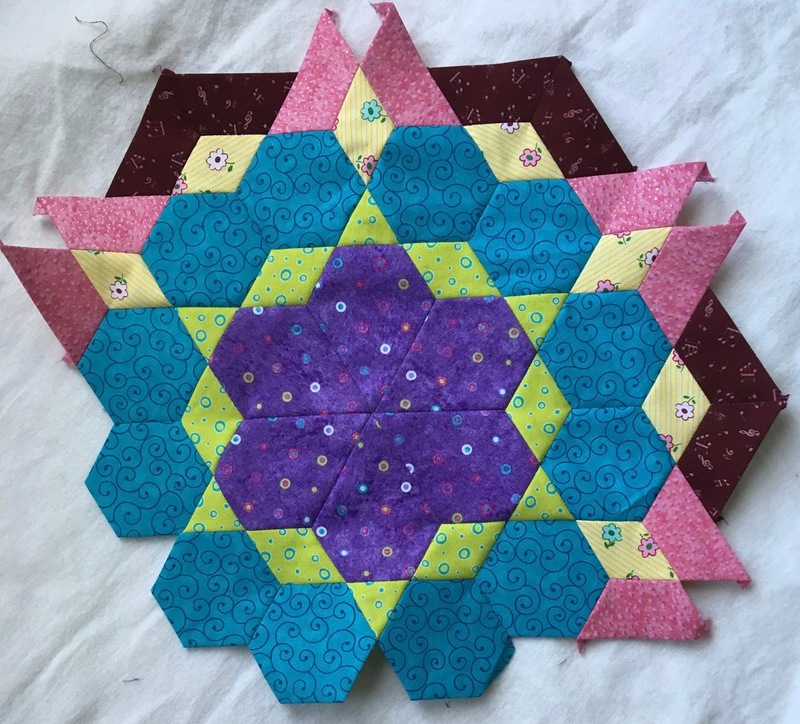 Then tomorrow, Charlene and I are driving to Norwich where we will be doing a workshop with the Quaker Quilt Guild, called English Paper Piecing - More Than Just Hexagons. That will be lots of fun, and I hope to have pictures. However, I have been known to get so involved in the fun of workshops that taking pictures gets totally forgotten, so I make no promises on that one (grin). I’m linking up to Kathy’s Slow Sunday Stitching before getting the rest of this day started. I haven’t done a Wednesday progress report in ages, mostly because all the projects I’ve been working on got stalled at the binding stage while I’ve been working on Leo’s Mane. However, Some of them are finally finished. 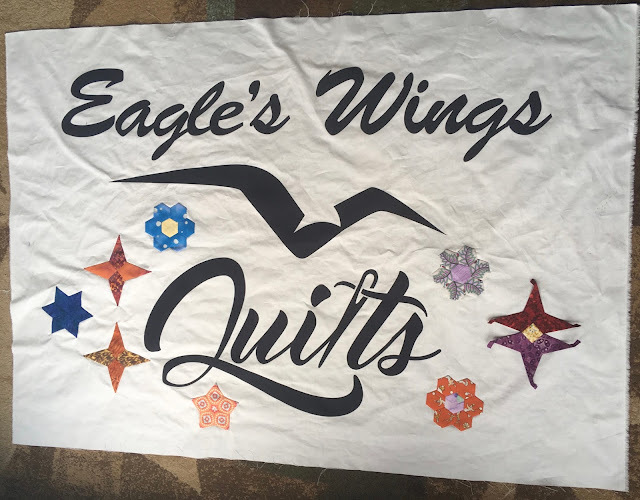 Our English Paper Piecing business is going to be attending some local quilt shows as a vendor in the next few months, so I needed a banner/sign for the booth. I took the logo from our business cards and mega biggie sized it, then cut it from some Kona Pepper and fused it to a Kona Snow background. I found some odds and ends of EPP shapes that were left over from other projects and hey presto, a sign saying who we are and hopefully showing what we sell. I finished it off with a lovely striped binding. We’re going to be at the Shedden quilt show this weekend, Friday and Saturday, at the Southwold Keystone Complex, in Shedden Ontario. Then I managed to get the table runner I was making from Honeycomb Wreaths finished. I love the colours in it. And since I was on a roll, I kept going and put the binding onto my version of Willyne Hammerstein’s Creme Brullee. Both of these got striped bindings as well. I love diagonally printed stripes for bindings. 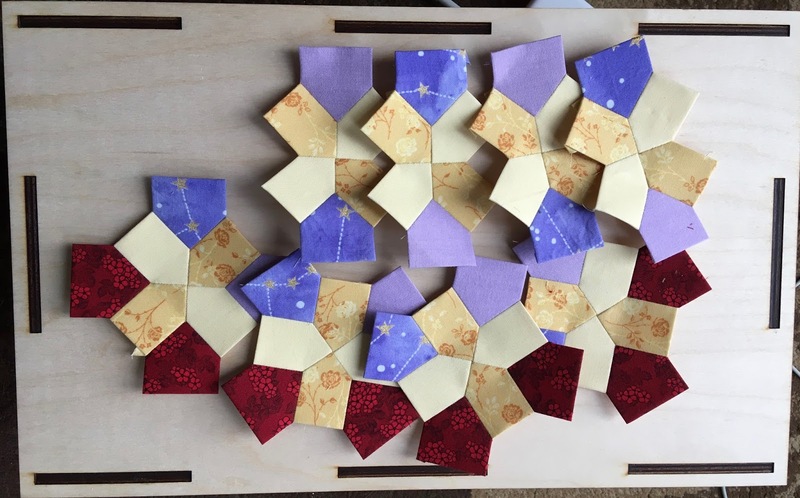 I’m going to link up to the Canadian Needle and thread Network’s WIP Wednesday and also to Let’s bee social. Then I have to sew down the bottom edges of a couple of hanging sleeves on these projects before I can call them 100% done. I working on finishing a couple of things right now. Our paper piecing business, eagleswingsquilts.ca is going to be attending some quilt show this spring and summer as a vendor. We’ve also started a trunk show and workshop, so we needed a sign. A couple of days ago I took the logo for the business and enlarged it hugely and the cut it out and fused it to a background. Since then I’ve been sewing various English Paper Pieced units to the background to give a picture of what actually it is that we do. I have one last piece to sew down and then I can get it onto the quilting machine. 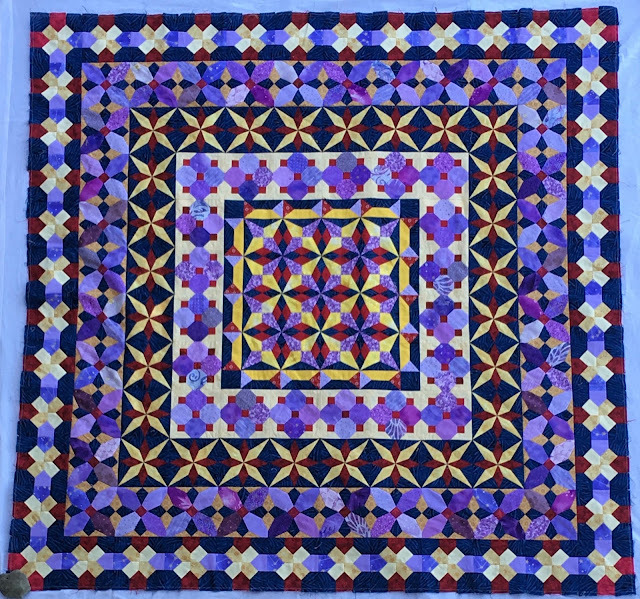 I’m working on a bit of a time crunch, considering our first quilt show is at Shedden Ontario starting on Thursday, April 12 for set up. The actual show is Friday and Saturday. It would be wonderful to see some of you there. 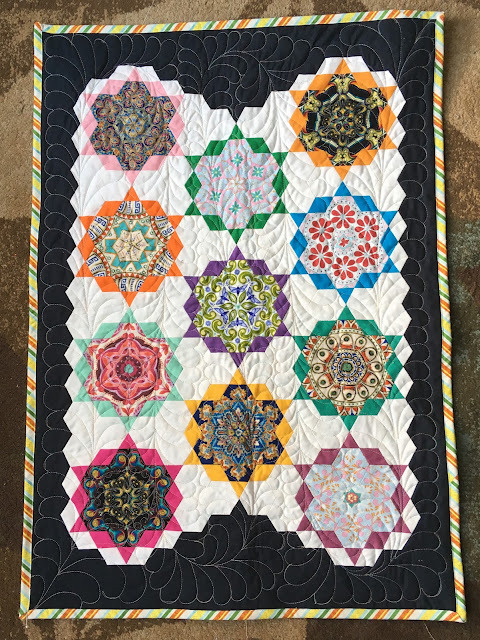 The other project I’m working on finishing is a table runner made up of three variations of a honeycomb wreath that will be on display at the quilt show. There are kits in the store available to make them and we’ll be taking some with us to the quilt show. So, with all of that in mind, I’ll finish this very short post, link up to Kathy’s Slow Sunday Stitching and then get back to my stitching.